“Is there an issue more globally urgent than ways to create truly inclusive societies?” We think not. Two months have passed since Rufus Wainwright sang out the debut 6 Degrees with an a capella version of ‘Candles,’ his lovely song about faith and doubt. Wainwright stood alone on the stage at Koerner Hall in Toronto, and the purity of his voice resonated with the 1000 people present to see His Highness the Aga Khan receive the inaugural Adrienne Clarkson Prize for Global Citizenship. Our citizen space began with a stirring lecture by Naomi Klein; it ended three nights later with Adrienne Clarkson and the Aga Khan quietly sharing their experience and wisdom. We liked the contrast. The inaugural 6 Degrees surprised even us. It turned out big, bold, and impactful. 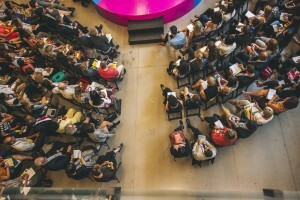 What has stayed with the ICC team the most – what we are taking as our baseline in expectations moving forward – is the energy at the events, and in the space itself during the two days we congregated, 400 strong, at the Art Gallery of Ontario. We’re still looking for the exact words to describe the feeling in those rooms. The mood was real, grounded, youthful, critical, excited, optimistic; it was the energy that is required to advance conversations and expressions that are about change, about what really can happen in the right place, at the right time, with the right people gathered together. What else has transpired in those same two months? To be honest, we’re dismayed by the growing negativity in so many nations about the value of diversity. The Economist recently dubbed Canada the “last liberals” standing, and it does seem we are one of the few countries where immigration is still widely held as a positive. In the lead up to 6 Degrees we posed a question: “Is there an issue more globally urgent than ways to create truly inclusive societies? Then our media campaign declared the citizen space to be the site of “the important conversation we will ever have.” Some thought the question too sweeping and the declaration an over-statement. Post Brexit, post American election, we’re pretty sure we’ve framed the matter right, and captured the urgency of the situation not a moment too soon. 6 Degrees, we promise, will proceed accordingly in 2017.